Francis lamented “the pressure being exerted by great business interests that want to lay hands on its petroleum, gas, lumber, gold” and industrial scale farming. He later highlighted the “endless violence” endured by the region’s women. Bare-chested tribesmen, their bodies painted and their heads crowned with colorful feathers, danced and sang for the pope when he arrived in the Peruvian city of Puerto Maldonado. Thousands of indigenous people had traveled to meet the pontiff from throughout the Amazon basin region of Peru, Brazil and Bolivia. 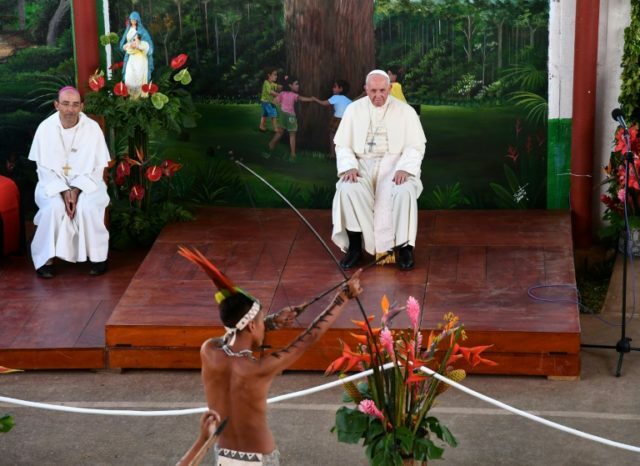 Members of one of the tribes presented the leader of the world’s 1.2 billion Catholics with a bow and arrow in a symbolic gesture aimed at urging him to help defend their land rights. “The native Amazonian peoples have probably never been so threatened on their own lands as they are at present,” said the pope, who appeared visibly moved by the reception. “Amazonia is being disputed on various fronts,” he said. “The problems strangle her peoples and provoke the migration of the young due to the lack of local alternatives. The Amazon region will be the focal point of a world bishops’ meeting, or synod, to take place in October 2019. Local tribal leaders and conservationists are increasingly concerned about rampant illegal gold mining and logging that have devastated ancestral lands. The pope later received a raucous welcome when he visited a shelter for vulnerable children and adolescents, victims of physical, sexual or psychological abuse. “The world needs you, young men and women of the first peoples, and it needs you as you are,” he told them. Returning to Lima in the afternoon, the Argentine pontiff hit out against corruption in a speech to dignitaries at government headquarters, where his audience included President Pedro Pablo Kuczynsky. “How much evil is done to our Latin American people and the democracies of this continent by this social ‘virus’, a phenomenon that infects everything, with the greatest harm being done to the poor and mother earth,” said Francis. On Saturday he is scheduled to visit the northern city of Trujillo, where floods killed more than 130 people, and speak about climate change. He will fly back to Rome on Sunday after mass at an air base. The pontiff, 81, arrived Thursday afternoon in Peru, the second and last leg of a week-long South American visit. During the first part of his visit, in Chile, Francis highlighted the plight of vulnerable immigrants, offered an apology to victims of sexual abuse by Catholic priests, prayed with survivors of Augusto Pinochet’s brutal dictatorship, and called for protection of Chile’s persecuted indigenous communities. Before his visit to Chile, the US-based NGO Bishop Accountability said that almost 80 members of the Roman Catholic clergy had been accused of sexually abusing children in Chile since 2000. At the pope’s first public mass in Santiago on Tuesday, he faced protests over the church’s handling of decades of sexual abuse. Scuffles broke out between riot police and demonstrators near O’Higgins Park, and police used water cannons on protesters. More than 50 people were arrested, authorities said. At the end of his visit, he robustly defended a Chilean bishop, Juan Barros, who is accused of covering up the sexual abuse of minors by another priest.